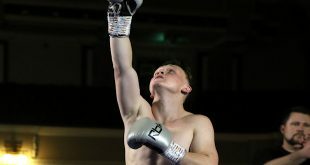 Last night at the Aston Sports Centre in Birmingham, England, Matchroom Sports and First Team Promotions hosted a fight night, headlined by Rob Norton vs. David Dolan, which also saw an action-packed undercard. 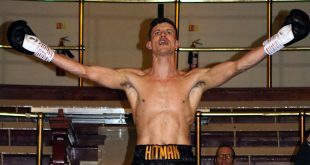 Wolverhampton boxer Dean Harrison enjoyed big support when he faced late opponent Laszlo Komjathi of Hungary in an eight round light welterweight contest. Landing body-shots early on, Harrison concentrates on throwing right and left jabs to the face of the Hungarian. Tough, experienced Komjathi dips low as he drives forward at Harrison and lands a flurry of shots mid-way through the second frame, but ‘Deano’ keeps focussed - digging in with another right body-shot. The Wolverhampton man throws a couple of uppercuts in the closing seconds of the fourth round and Komjathi keeps up a tight, high defence. The Hungarian gets through with a couple of straight jabs through the defense of Harrison in the sixth - but his shots don’t land solidly and Harrison is unfazed. Komjathi sustains a cut to the right eye during round seven. He’s been a good solid opponent for Harrison but Harrison's work-rate has been far better, with Sky Sports statistics revealing 105 to 49 punches landed in favour of the Wolverhampton man. “Come on Deano!” the crowd cheers, as they come out for the eighth and final round. Komjathi throws a good straight right hand which lands to the face of Harrison in the opening seconds of the final round, but seconds later Harrison returns with a solid straight right of his own which rocks back the head of the Hungarian. Mid-way through the frame Harrison now has a small cut to the left brow. The cut seems to waver his concentration a bit and Komjathi is successful with the right hand. It’s a good last half of the round for Komjathi, but Harrison gets the win on points 78-75. Sky's stats show that Harrison threw more punches and had the better success rate, 28% to 17%. Afterward, a modest Dean Harrison admitted he thought he was “Ok in the first six rounds then was a bit ‘ragged’ in the last two“ and felt he wasn’t using the jab as much as he could have. 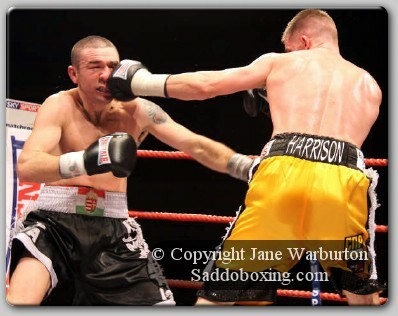 Harrison said he ’would be confident of winning over British Title holder Paul McCloskey’. Harrison's record now stands at 14-1 (4). 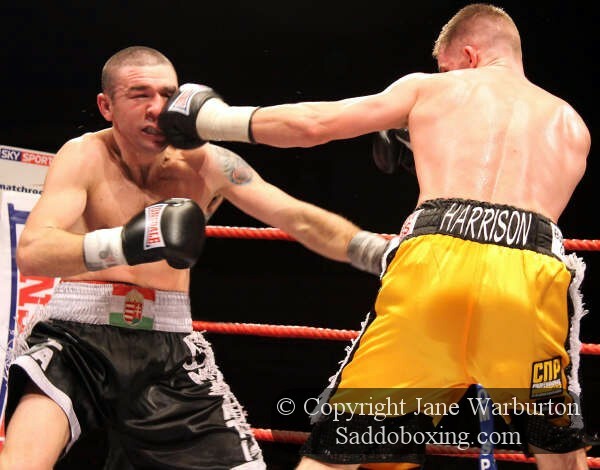 Harrison's stablemate and former British Welterweight Champion Young Mutley, aka Lee Woodley, of West Bromwich, faced Latvian-born Gatis Skuja of Bethnal Green in a six round light middleweight contest. Both men get off to a good - though cagey - start as they suss each other out.Mid-way through round three, a big swinging right hand from Mutley lands to the face of Skuja, who tucks in tight against Mutley's barrage of shots. A good round three for Mutley. Mutley keeps up the work-rate in the sixth and final round. Mid-way through the frame, he landa a good body-shot followed by a sharp left hook to the head of Skuja. Mutley dominated throughout and wins on points 60-54. Sky's stats reveal that Mutley threw 326 punches as opposed to Skuja’s 119 with a 29% success rate against Skuja's 6%. Mutley improves to 26-3 (13). Taller, rangey Arron had a tough fight in the form of Dee (Delroy) Mitchell but secured the points win 58-56. Arron improves to 12-3 (1). A messy contest which sees ‘Dangerous’ John Donnelly deducted a point in the fifth. Referee Rob Chalmers had a busy time trying to separate the scraps between these two. Donnelly wins on points 59-57 and improves to 9-1 (1). Unbeaten Hunt wins on points over veteran Carl Allen who enjoyed (or not?) his 100th fight. As usual, the experienced Allen proved tough opposition for popular Hunt, but seemed bothered by a nose injury from the start. Hunt's record now stands at 12-0 (1). 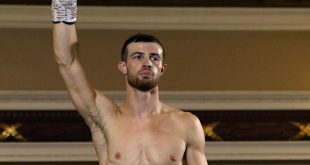 James ‘The Force’ Flinn was to face Welshman Russell Pearce, but snow conditions meant the Welsh contingent were unable to get to Birmingham. Flinn wins by points and improves to 4-0 (1). 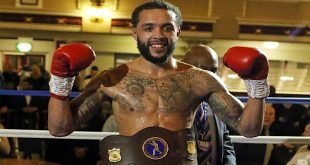 Ball was to face Swansea boxer Chris Brophy, but again took a last minute change of opponent because of weather conditions in Wales. Southpaw ‘Bully’ proved too much for debutant Selaves, who was stopped by the referee in round three. Ball's record now stands at 5-0 (1).